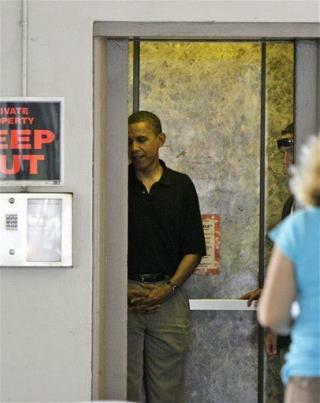 (Newser) – CDC security guard Kenneth Tate was excited when President Obama set foot in his elevator during his September visit, even shaking the president's hand in a moment that made him "proud," the New York Times reports. But when Tate escorted Obama back to his limo, he snapped a cell phone picture as a keepsake—something the Secret Service and his CDC bosses apparently didn't like. The 47-year-old was pulled aside, questioned, then terminated a week later (he tells the Times he still hasn't been given a reason); his son, who's worked for the CDC as a contractor for seven years, was also "downsized." Tate says he had taken photos of other bigwigs including former NYC Mayor Mike Bloomberg and followed all Secret Service instructions he was given. I've never had jobs where I could take a photo of anything. The guy needed firing. He wasn't working. My cousin got a close up photo when Obama came to our city to announce support for the Keystone pipeline (all a Hollywood event as he later rescinded his support). My couz was working in the secure area behind a hotel and snapped a photo of him getting into the limo. He had been cleared for weapons before that. I'll have to search through my pictures and find the snapshot I took of Richard Nixon about 5 feet away on the flight line around 1972 or so when I was in the Air Force. Or maybe not - the Secret Service may arrest me some 42 years later. There's probably no statute of limitations on picture taking.